Need to know the fitting dimensions for the Pioneer SPH-DA120? The below video has these answers. 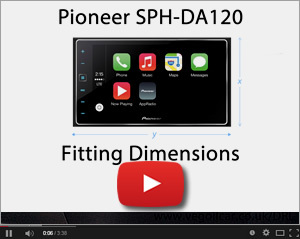 You may have already seen my video on Fitting a Pioneer SPH-DA120 with Apple CarPlay in my vehicle. I'll be honest, someone that did wrote to me and said - great video, but you don't mention what size it is. Well I guess if you're thinking of buying this model of Pioneer, then you certainly would like to know the dimensions. But this requires just a little explanation as there's a face frame, a support frame, an aperture, etc, so I thought it quickest and easiest to give the Pioneer SPH-DA120 dimensions in this YouTube Video. It's nice and short and, hopefully, gives all the information you'll need. If you have any questions, as always, please don't hesitate to get in touch.